There have been lots of folks pretending to be the IRS lately. If you have an IRS tax lien or IRS bank levies or IRS wage levies you could be a victim. What To Do If Your Missing a W-2? How is Bryson Law Firm, LLC Different from Other Law Firms? 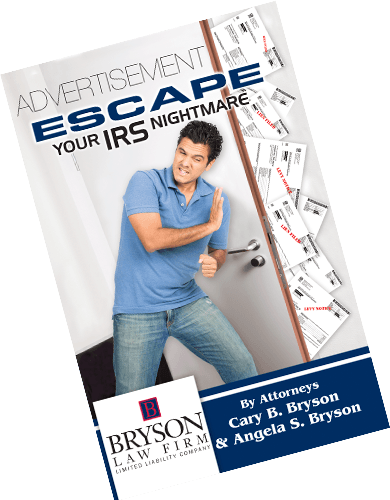 How is Bryson Law Firm, LLC different from those companies and other law firms who are pounding the TV, radio stations and Internet across the country promising to solve your tax troubles for pennies on the dollar? The IRS is warning the public about a phone scam that targets people across the nation. WASHINGTON — The Internal Revenue Service today announced the nationwide rollout of a streamlined program designed to enable small businesses under audit to more quickly settle their differences with the IRS. Hundreds of employees of Internal Revenue Service contractors owe millions of dollars in federal tax debts, according to a new report. A couple of days ago we were called by a client who received a phone call from someone claiming to be from the IRS. The Internal Revenue Service is putting the brakes on tax liens and levies during the federal government shutdown. It's day #7 of the shutdown. So far, there's no sign that it will be ending any time soon. Beware of the Latest IRS Scammers! We have received several calls from clients advising us that they have been receiving calls from "The IRS" warning them that they are going to take "LEGAL ACTION", that it is "URGENT", and there is some kind of discrepancy.